Dress, shoes, hair, makeup, jewellery; there are definitely staples when it comes to what to wear on your wedding day. For many brides, the hard part is finding a look that aligns with their wedding theme or style. 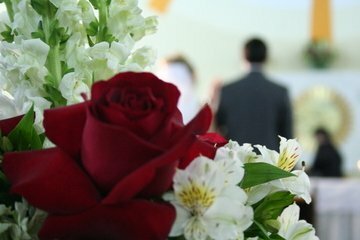 Below is some information and inspiration on different wedding themes and how to dress for them. Vintage weddings are for those who want to travel back decades, or even centuries in some cases. Worn wood, weathered furniture and accents, high ceilings and lots of candles are all elements of this style or theme. For vintage weddings, pick a dress that aligns with the period that inspired your wedding. Often brides who love the vintage look will opt for simple dresses with lace, short (or long) sleeves. Materials such as tulle and satin can have a soft and vintage feel. One should avoid too much bling when trying to stay within a vintage look. For hair and makeup, a slick updo is a classic look that never goes out of style. Old style hairpins are a small but elegant touch for a vintage feel and inspiration. Vintage makeup is often simple, soft and subdued with a bold lip colour. Chic, trendy, modern weddings may be more in line with some people’s style. This style features lots of geometric shapes, contrasting colours, marble, black and white, and very clean design elements. Dresses to align with a more modern style are often clean regarding design with an A-line neckline, different and unique patterns and materials, and a tight fit. 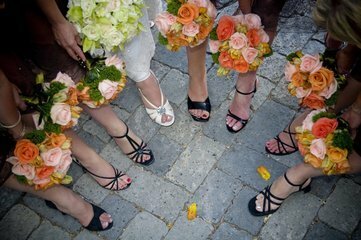 The type of shoes worn by modern brides are often sleeker and less glittery, and can even have bold pops of colour. Hair and makeup are often more dark and mysterious, played up to offset the minimal dress and décor design. String lights and barn wood are almost always incorporated into weddings where rustic is the name of the game. These weddings often take place in old, chic barns or farmhouses. Rustic dresses are full of lace, have trains, and many brides who have rustic dresses favour a long, flowy style with a higher, more modest neck. You won’t find many mermaid style dresses at rustic weddings. Shoes can range from cowboy boots to booties to strappy sandals, depending on the venue. Long, flowy waves with flowery details are often the hair of choice with minimal accessories and subtle makeup. Beachy weddings can be an entirely different ballgame. Beach weddings take place..well… on the beach, of course. Beach weddings are no place for stilettos or heavy makeup. The heat and sand make these events a place for shorter dresses, flip-flops or sandals, natural hair and bright makeup. The themes often include summery colours such as turquoise or pink.